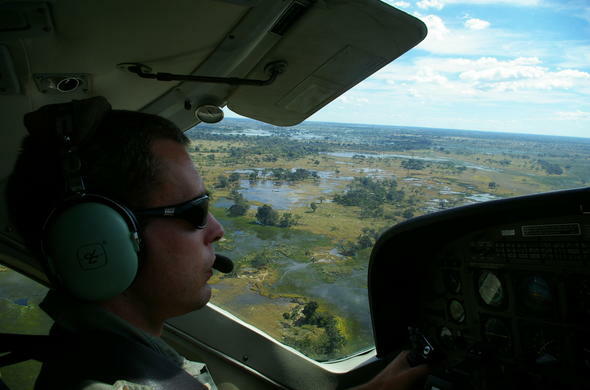 Botswana's Okavango Delta is a vast landscape of floodplains and islands, a landscape that changes year by year, with new islands formed each season. The islands of the Okavango Delta vary in size from the smallest single termite mound to the large body of land that dissects the delta known as Chief's Island. The extent of the islands is only really appreciated in the dry season when the delta is in full flood and the land parts above the high water mark stand out, barren against the lush waterlogged plains. Many of the islands are encircled by lush riverine vegetation of tall trees and 'thick' bushes, and have a center of desolate white soil. This happens when the trees encircling the island transpire, leaving large amounts of trace minerals in the soil which then becomes too 'acidic' for any plants to grow. The physical nature of the Okavango Delta is constantly changing as termites and hippos reshape the landscape as the seasons' progress - new islands are formed whilst others are swallowed up by the trampling of animals and the arrival of the floodwaters. The Okavango Delta does not rest. It is a place that is been reshaped every moment of the day. Hippos cut new paths, blocking others through a build-up of earth and vegetation in the old channels. Floodwaters are not forceful enough to push these blockages aside - the waters will simply flow around them, creating new channels. Over time detritus will build up against a blockage and as the seasons pass the build up may become sufficient enough to form a small island - which will expand over the years.Termites are responsible for more physical changes to the landscape of the delta than anything else. With the first rains millions of termites will be released from the colonies. Most of these termites will be eaten by birds and other creatures but many will survive and find suitable mates - which will then unite to build new colonies across the delta. A termite colony is protected by a hard, waterproof nest. These nests can often be seen as high mounds rising from the ground. The Okavango Delta is littered with the termite mounds. Some still living some long since disused they are used as perches, territorial posts, lookouts and places of safety by the denizens of the Okavango. A question that is often asked is how the termites manage to build such large structures in a flooded water waterway. The answer to this lies in the seasons. When the rains arrive, and the termites are released, the delta is at its lowest levels. The floodplains are dry allowing the termites time to construct a suitable waterproof structure before the arrival of the floodwaters. Many of the termite nests are build on the islands but it is common to see the structures rising from the floodplains. It is also often remarked as to how large the termite mounds are in the Okavango Delta. The reason for this lies in the structure of the mounds themselves. In most parts of Africa the working part of a termite mound is underground and all that shows is the characteristic ventilation funnel, but in the Okavango Delta the structure has to be built above the water table - which is very close to the surface in the Okavango.